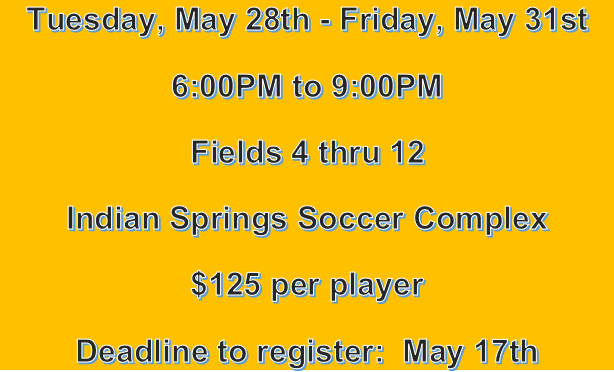 Looking for a camp to develop your child's soccer skills? This camp is designed to challenge your player with the drills and skills to take your player to the next level. Players ages U6 through U14 can "Camp with the Champs!" What's included? All players receive a camp shirt, professional training from nationally licensed coaches, and learn the game through technical, tactical and live game scenarios. Camp Check-In: Tuesday, May 28th from 5:30pm - 6:00pm (under Pavilion) - East side of Indian Springs Soccer Complex under the tree between fields 7 and 8. Please note: If there are any weather related changes, all communication will come from BASC via email to the same email address as you have listed here.